The Audubon Driving Park Track was used in the late 1880s as a horse racing track. ("Driving" referred to horse riding.) Audubon Park, built in 1879, had been the site of the World's Industrial Cotton Centennial Exposition in 1884 and 1885. Starting in 1887, the arena hosted a new amusement for the people of New Orleans: bicycle racing. The tournament held that fall was attended by around 3500 people, the majority of the spectators being women, to the pleasant surprise of the cyclers. Enthusiasm for the bicycle as spectator sport and pleasurable transportation rose over the next four years. Reports on the races took up more and more space in the newspapers. The bicycle races at Audubon park became grand affairs for the city’s bourgeoisie. Women were especially caught up in the racing fever, filling the majority of the stands and wagering personal articles on their favorites. 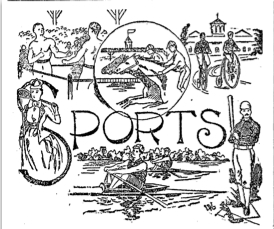 From 1887 to 1890, the Louisiana Division of the League of American Wheelmen held their annual tournament at the Audubon Park track. By 1891, however, the track had been abandoned, to the wistful regret of the cyclists. 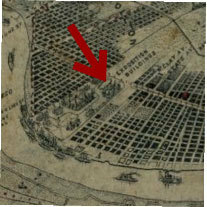 In 1891, the League began holding tournaments at the Fair Grounds. 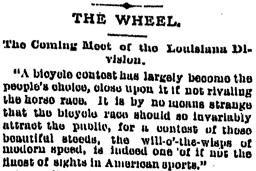 Lacar Musgrove, “Cycling Races at Audubon Driving Park Race Track, 1887-1890,” New Orleans Historical, accessed April 24, 2019, https://neworleanshistorical.org/items/show/532.